Even on vacation, I couldn’t help noticing this piece in today’s Times about President Obama’s news-reading habits and his criticisms of some of the coverage. The news media have played a crucial role in Mr. Obama’s career, helping to make him a national star not long after he had been an anonymous state legislator. As president, however, he has come to believe the news media have had a role in frustrating his ambitions to change the terms of the country’s political discussion. He particularly believes that Democrats do not receive enough credit for their willingness to accept cuts in Medicareand Social Security, while Republicans oppose almost any tax increase to reduce the deficit. Privately and publicly, Mr. Obama has articulated what he sees as two overarching problems: coverage that focuses on political winners and losers rather than substance; and a “false balance,” in which two opposing sides are given equal weight regardless of the facts. Mr. Obama’s assessments overlap with common critiques from academics and journalism pundits, but when coming from a sitting president the appraisal is hardly objective, the experts say. Irony alert: after quoting Obama on the problem of false balance and explaining the concept, the piece goes on to engage in the very practice. 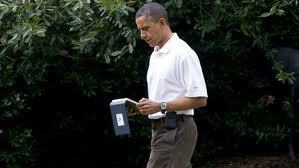 To his credit, Obama seems to read a lot, and that can’t be a bad thing. Now, back to the beach. Michelle Bachmann, a former flavor-of-the-week in the lengthy, fickle Republican primary campaign for the presidential nomination, has a gripe. Not surprisingly, she is complaining about the media. This, of course, is a time-tested tactic for Republicans, especially when they are feeling politically desperate. 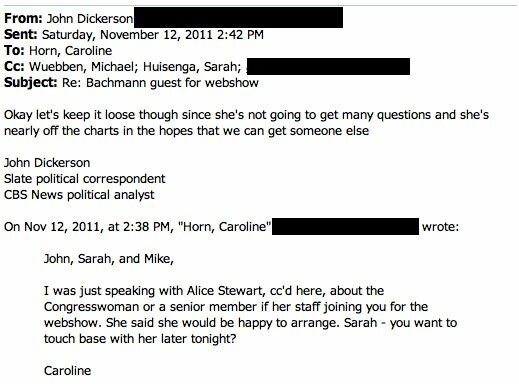 Bachmann claims to have caught CBS News in a “gotcha” moment that she believes confirms her suspicions of liberal bias at CBS. Now, it may well be that there are liberals at CBS, but this episode does not prove her point. In fact, I believe it proves the opposite point. Briefly. . . As recounted in today’s NYTimes, the guy in charge of political coverage at CBS, John Dickerson, was caught doing his job. He was trying to find an online guest for a show he was orchestrating that would follow the latest Republican debate on Saturday night. In an email to colleagues, he said he would rather “get someone else” other than Bachmann. His reason? She was “not going to get many questions” and “she’s nearly off the charts” in the polling of voters’ preferences. If we look at what he actually said, it appears that his criteria for choosing the guests to pursue were non-political, non-partisan, and non-ideological. Like any good producer, he wanted a “hot” guest — hot in the sense of someone who is trending, someone who is going to create or amplify buzz, someone who is going to add to CBS’s ratings. He does not want someone who was last week’s news. Simple as that. And the facts bear him out: Bachmann did indeed get few questions in the debate and little air time, and she is dying in the latest polls. (CBS’s own latest poll had her in 6th place with just 4% support.) That is not to say that she could not surge again; if she does, Dickerson and every producer, host, and booker in politics will be chasing her. Not because they like or dislike her and not because they agree or disagree with her. It will be all about blowing on the hot coals.